Wild Child Stories: GIVEAWAY ~ WIN a free 3-month Subscription to LOOK Magazine! GIVEAWAY ~ WIN a free 3-month Subscription to LOOK Magazine! As you may have guessed from the title of this post, its time for a giveaway! The lovely people at LOOK Magazine (the UK's best selling fashion magazine) have given me a 3-month Digital Subscription to give away to one lucky reader! 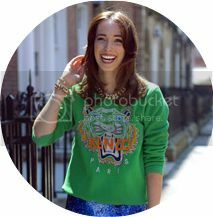 I have always been a massive fan of LOOK Magazine, and website ~ they're always so up to date on all things fashion & high-street style! To be in with a chance to win this awesome prize, all you have to do is to follow my Blog on Blogger or with the GFC button, using the Rafflecopter widget below. You also have the option of earning additional entries by following me on Facebook, Twitter, Instagram, and Tweeting about the giveaway. The winner will be chosen randomly in a weeks time, so get your entries in and good luck!